Down in the sewers, the pre-teen Turtles are playing hide and seek to test their ninja skills, with Raph as “it”. Raph plays it cool, knowing they’ll never find him and all he has to do is sneak up behind his brothers and tag them to win. Elsewhere, three thieves (Lee, Book and Whiskers) are on the run from the police and take refuge in the sewers. They’ve stolen a special chip, which Book has stashed in his mylar bag containing an issue of Duck Comics. Hearing voices, Raph decides to end the game and springs out to tag his brothers. Unfortunately, he tags the thieves who immediately open fire on him. Leo, Don and Mike rush to the rescue and in the skirmish, Book loses his comic and computer chip. The thieves flee from the “tiny green street people”, and once they’ve fled, Splinter comes out of hiding. Splinter criticizes his children’s form, particularly Donatello. Except it was Raphael who was sloppy; Splinter is having trouble telling them apart because they’re all wearing red bandanas. Realizing that Splinter can’t differentiate between them, the Turtles begin to use that to their advantage. When Mike breaks a vase, the Turtles refuse to tell Splinter which one of them is Michaelangelo. This backfires, as Splinter ends up punishing them all to sewer tunnel litter duty. Pouting, Don hatches a scheme to get even. The next day, during their math exam, the Turtles all take the tests individually and they all get As. Splinter is pleased with his children’s performance while the Turtles snicker behind his back. At a secret location, the trio of thieves report back to their shadowy master. The figure tells them that the chip has the power to jam police band radios, making the construction of his criminal empire all the easier. He then tells them to find the chip or be executed. The thieves reluctantly return to the sewers, vowing not to fail their master… Master Saki. Later, after the Turtles all ace a spelling test, Splinter becomes suspicious. He realizes that his sons have been tricking him; each Turtle would take the test in the subject they’re best at four times, so that way they all pass and get rewarded with pizza and treats. Splinter then administers a history test (Mike’s best subject) and fails everyone but Mikey. 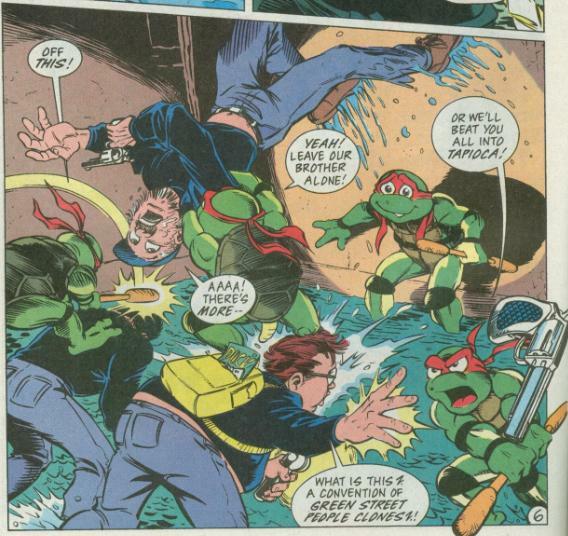 The Turtles suspect Mike of betraying them, and the moment they get him alone, they begin beating him up. The pummeling is interrupted by the approach of the three thieves, who find the issue of Duck Comics with the chip in it. The Turtles decide to use their trick on the thieves and get rid of them for good. Playing up the “monster” angle, the Turtles attack individually, making it appear as if there’s only one of them but they can teleport around the sewer tunnel. Racked with fear, the thieves are easy to defeat and tie up. Splinter comes out of hiding and tells his sons to drop the thieves off at the police station (secretly). He also tells them that he figured their trick out, which is why only Mike passed the exam despite all the tests having the same score. 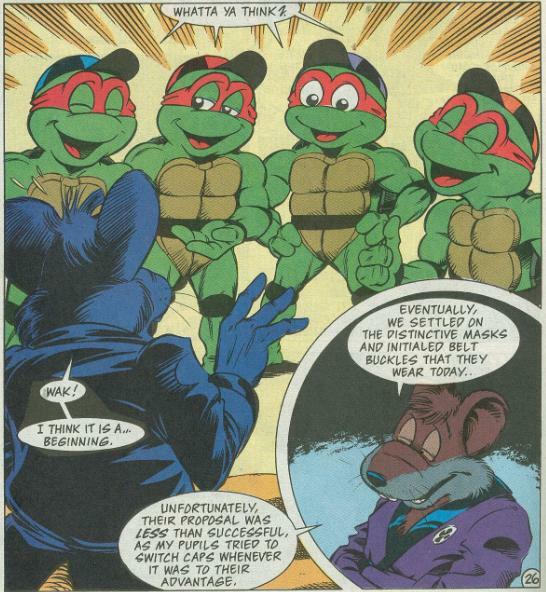 The Turtles apologize to Mike for beating him up and apologize to Splinter for trying to trick him. As they drag the thieves to the police station, they try to figure out a way to make themselves stand out uniquely. Reading through the copy of Duck Comics, they figure it out! The Turtles then return to Splinter wearing red, blue, orange and purple… baseball caps? The look doesn’t last and they eventually settle on multi-color bandanas. 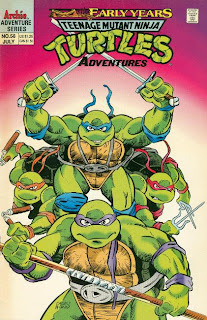 *The prologue/epilogue of this story is continued from TMNT Adventures #57. The story continues in TMNT Adventures #59. *The government official mentions the news reports of mutant turtles on TV. The Turtles were caught on camera in TMNT Adventures #47. *The Pre-TMNTs will appear again in TMNT Adventures #71. *On page 11, a piece of trash Mike picks up in the sewer is a copy of The May East Saga. Looks like Murphy (Clarrain) didn’t like that story any more than we did. *This issue also contained a bonus “Punk Turtles” pin-up by Brian Thomas. On principle, I have nothing against this sort of flashback story being used as a breather issue between heavy, action-oriented arcs. It was cute and light and pretty fun for what it was, and the aforementioned cuteness acts as a great juxtaposition with the terribly grim bookending segments. The problem, then, is the execution. I suspect that the pre-teen Turtles story was originally commissioned for a TMNT Special or something, and I do so for a couple of reasons. Firstly, the prologue has its own title separate from the title of the main story, which is weird. But more than that, the prologue ends with Mikey narrating the story of his youth, but when that story starts, it’s narrated by Splinter. The epilogue tries to harmonize this by having Splinter’s narration segue into Mike wondering about Splinter’s safety, but the two don’t mesh in the slightest. There’s also the fact that Splinter is shown telling the story to *someone*. Why would Mike remember Splinter telling him the story of how he got his orange bandana? It just doesn’t make any sense. This was clearly a filler job to keep things on schedule; they took a completed story then slapped a 3-page bookending sequence on it to make it seem relevant. Their attempt to bridge the two was sloppy and it could have used a lot more effort to harmonize things. I know it would’ve been more work, but either Sullivan or Murphy should have rewritten the narration in the main story to be in Michaelangelo’s voice. They’d have to have removed that last panel of Splinter looking at the audience and ending the tale, but I’m sure they could have filled it in with something. As it is, the conflicting narrators are just confusing. But, were you to ignore the bookending sequences and take the pre-teen Turtle story on its own, it’s actually pretty enjoyable. The cameo from “Master Saki” was a nice touch and I like how they downplay his identity. He’s a shadowy figure when he appears and his name is only dropped once, and in passing, by the thieves. It makes one stop and think how this story affected Shredder’s own timeline, too. He clearly has his sights set on acquiring hi tech devices, but his usual band of idiot thieves don’t cut it. It isn’t much of a leap in logic to see how this failure would drive him to ally himself with an alien brain in exchange for advanced weaponry and machines. He also doesn’t appear to have taken on the identity of the Shredder yet, as his flunkies call him by his real name (something he found infuriating in his first appearance at the beginning of the series). The idea that Splinter can’t tell his sons apart instinctively doesn’t reflect too well on the old rat, I have to admit, though the concept made for an amusing plot. I did get a laugh out of the Huey, Dewey and Louie hats at the end; a pretty good fake-out. Brian Thomas’s art is also really expressive and energetic; there’s a lot of fluid energy to it. If you compare this story to his earliest work on the title it’s amazing to see how quickly he grew and changed. Overall, the only thing really bringing this story down is the slapdash prologue/epilogue, but even then, that’s only 3 of the 27 pages in this issue. The narrative transitions are poor, yes, but you adjust pretty quickly to who is and isn’t talking, so I suppose it isn’t that big of a deal. Huh, you know I dont remmber the Mike part you are talking about in the swedish hero version so I guess this mean that the swedish one is better? But funfact, the swedish had one off Usagi Yojimbo storys from time to time. Awesome but a bit weird in context. Its was a kid comic after all. You really prefer this explaination for the colored bandanas? I dunna, the fact that they get their favorite colors only after wearing their missing comrade and wearing his color for solidarity, BUT not using their real names but some goofy names given to them by a random lab assistant? I think I prefer the whole "Turtles can't be told apart." Besides, they were being sneaky at one point, actively trying to trick Splinter. I'm sure in certain circumstances they would be hard to tell apart at that age without the multicolored masks. I felt the entire taking on new names thing had more to do with the fact that Yoshi had just waken up eight hundred years later after his head had been sliced off. For all he knew, enemies that recalled his name could very well still be around at that point. I've got a "Marvel no-prize" theory on the flashback story's placement in the Archie continuity. I propose that Mikey remembered Splinter telling this story to April during that whole "interview" segment she did with him in the Prologue and Epilogue segment of the Tundra TPB. Perhaps she got Splinter to agree to a lengthy interview detailing the turtles' origins and early adventures in case such a time ever arose that their story ought to be made public. After summarizing the Ray Fillet-Chameleon stories, he also covered the "Final Conflict" arc. Then April started asking other questions, such as why the TMNT got their color masks and (later on, I guess) their distinctive weapons. Mikey remembers Splinter's narration because he must have been listening-in as the interview unfolded. I've always liked this issue. 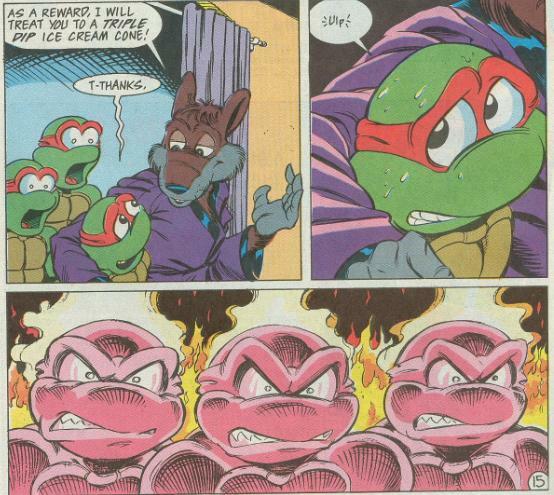 The way the young turtles try to act like evil demons to spook those thugs makes for some really great visuals. Brian Thomas did a great job overall, but little touches like that cut-away emotional overemphasizing in the panel of the firey turtle heads you posted was really "anime-esque" before most Western artists even knew such a thing existed. Kudos to his fill-in job. this was pretty much random but i liked it all the same, had a few good laughs while reading it! Uh, I don't read the idw tmnt. What's the rainbow bandana reason?